When I was in college I thought of myself as a feminist. However, the more the got involved in politics and saw national feminist organizations in action, the more I knew that there couldn’t be middle ground with most of them as they are abortion extremists. Now, I know that many in our movement like to call themselves “pro-life feminists.” Hell, I used to do it too. I get it. It sounds cooler to friends. You can say you’re “pro-life” but, by adding the word “feminist” in the label, you can make them think about your views differently, a mental double take. It gives you a way to separate yourself from the pro-life tactics you disagree with or with the visions of crazies (i.e. AHA) that some people have when they hear the word “pro-lifer.” However, with only 1 in 5 American women calling themselves feminists these days, does the label even matter anymore? We all agree in the equality of women. I mean that’s what we fight for in the pro-life movement every day, for a world where no woman ever feels like she has to choose between the life of her child and the life she has dreamed for herself. We’re the ones fighting for the little girls being torn apart inside of their mothers, hundreds of times each day in Planned Parenthood facilities. Shouldn’t we put our time in trying to ensure America knows what pro-life or anti-abortion really means, encouraging them to join our movement which seeks to restore human rights to those most vulnerable in our society? Anyway back to work…random thoughts while writing my speech for Berkeley this week…. Over two decades, FFL donors have sacrificed to support our efforts to help Students for Life at the national, state (Illinois and Michigan), and campus levels. We developed and shared our Pregnancy Resource SurveySM and Guide, the first national directory and map of on-campus resources and support (which became the basis of Pregnant on Campus), babysitting group and rally instructions, and original kits on the history of pro-life feminism. It’s not just that we are “cool.” Feminists for Life is no mere strategy. It is who we are and drives what we do, connecting history to policy to resources proven to support the mother and life of the child well beyond birth. We are proud of our record of accomplishments for those at highest risk, including those who are poor, women who are coerced into abortion by threats to withhold child support or on the receiving end of a fist, women who had abortions, desperate mothers, and college-age women — many of those who self-identify as feminists. So why choose to ignore or offend the very people we need to reach? Because of our commitment to change the world by equipping the future leaders of our country and reaching those at high risk of abortion, and because of the stunning silence by professors who should teach our rich pro-life feminist history, FFL created our College Outreach Program to share with SFLA. This was made possible by the sacrifice of our members, strategic donors, dedicated staff and volunteers, and visionary Board members. I thank them. 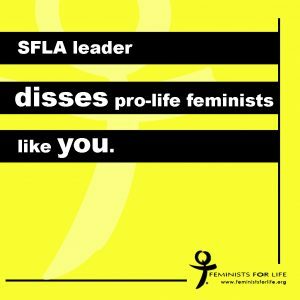 So for the life of me, I can’t understand why the president of SFLA would go on a tour of campuses to use FFL’s original research documenting how our feminist foremothers were pro-life, while at the same time dismissing pro-life feminists — as if we aren’t systematically eliminating the reasons that drive women to abortion? Instead of dissing feminists at-risk of abortion, FFL prefers to share our feminist history, and rolls out the red carpet to welcome those who have never known a day without illegal abortion! Last week we held the 22nd Annual FFL Pregnancy Resource Forum(SM) at Georgetown, and it was great to have an SFLA staffer on the panel, along with GU administrators and the Northwest Pregnancy Resource Center and Maternity Home. Next week, I’ll be at Wheeling Jesuit and Franciscan University, and I have just accepted an invitation to speak the day after we March for Life in Washington D.C., at the largest student run pro-life conference in the country, the Cardinal O’Connor Conference for Life at Georgetown University. Also, our friend Abby Johnson and those in And Then There Were None have asked that I present “End the Feminization of Poverty that Drives Women to Abortion” at the annual national Pro-Life Women’s Conference in St. Louis the last weekend in June. I am so excited about our momentum and these collaborative efforts! I hope to see you at one of these and other events in the works. Despite being dismissed by SFLA’s leader, our commitment remains to all pro-life student groups. You and those at highest risk of abortion are our priority. We are here to equip you with “Pro-Woman Answers to Pro-Choice Questions™,” our message that Women Deserve Better® than Abortion, with real pro-life feminist speakers, FFL Pregnancy Resource Forum moderators to help change your campus by working with your administrators, lots of free materials about pro-life feminism, and real-world solutions as women WORK, LEARN, LIVE, LOVE, available through our new resource, WomenDeserveBetter.com. As you work to realize the vision of Susan B. Anthony and the other pro-life feminist foremothers who refused to choose between women and children, and as you refuse to choose between your education and career plans and sacrificing your children, and as you work to make abortion unthinkable, you too walk in their shoes.